One of the great things about being with Laverne for a few days was that we got to talk about weaving, ALL the TIME. We hardly stopped looking at textiles and discussing them - textiles we make, textiles we own or get to visit and touch, and those we only see in video. The conversation was constant and wide-ranging, as endless as our fascination for how woven things are made. I pulled out so many things to show her that I kept seeing enticing new arrangements and juxtapositions among my own collection, as above. The textiles always want to converse with each other, too. Luckily, a beautiful exhibition of pieces from the collection of Leslie Grace was still up at the Aljoya Thornton Place. This is where Leslie lives, and they hung gems from her collection throughout the lobby and hallways very nicely, with variable amounts of information. I don't know where to start or how to order things, so I will just follow our trail through the exhibit, more or less. Each piece was exquisite quality, drawing me in with its fine detail and workmanship. Some were familiar techniques and traditions, others completely unknown to me, like the North African headscarf resist-dyed with indigo and intricately embroidered. It is woven from handspun wool. How I would love to see the weaving method for this! 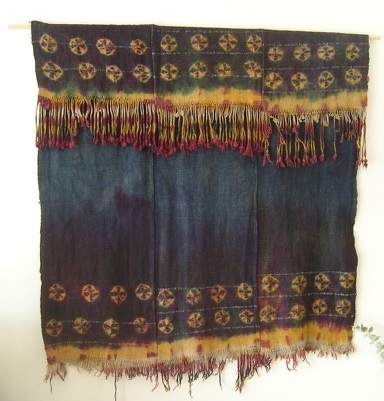 Tunisian wool resist-dyed head cloth, with embroidery. The image reminded my husband of Zanskari lingste, the dyed handwoven capes I collected in Ladakh, and there is a distinct resemblance. This bow-loom-like triangular loom, made from a single bent stick, was familiar to Laverne, because she had seen a similar piece in another collection (Ravelry link). The looms are used to weave plant fiber into wristlets that have something to do with archery (the information is thin on the ground in these collections.) The patterning sticks control which warp threads will be raised in each pick, and the weft is carried on a tiny shuttle. The weaving is a bit more than two inches wide. When finished, the fringe passes through the loops at the beginning, making an adjustable cuff. Finished cuff with fringe threaded through loops. Another lowland Peru group (name and place unknown) was represented in the collection by beautiful, naturally colored cotton warp-faced plainweave with striped patterns. A photo showed them wearing long tunics, and on display were a bag and a flat cloth with incised bone decoration. We were both enthralled by the simple beauty of the stripes. Detail of bone tassels and bag strap, handwoven cotton. Bag detail, showing a cross knit looping edging around the top. Naturally colored cotton. Below is another warp-faced plainweave garment, a tube skirt from Burma (Myanmar), embellished with supplementary weft patterning. I'd seen examples of this when I worked at an import store years ago. Our favorite display was the one used in the promotional photos for this exhibition: a sarong and jacket from Sumatra. It's also warp-faced, surely backstrap woven, and embroidered with extreme intricacy. The mirrors in the blue field are less than 1/4" across. The color combination is stunning, indigo against a deep, glowing gold. It was striking to me how many of these pieces, from all over the world, were warp-faced backstrap weavings. Laverne and I could look at them and envision creating that structure ourselves, because it's the way we weave. I may not achieve the refinement of skill necessary in this lifetime, but I can relate to the weavings, and see how they've been made. These are all extreme detail shots, and I apologize for not showing the entire piece, but in this way you are looking the way we looked, as closely as possible. Jacket detail, handwoven and embroidered in Sumatra, late 19th/early 20th century. Finally, an extremely fine sarong from the Li people of Hainan Province, China, which is way out of my league for many lives to come. And yet, I'm familiar with the weaving technique. 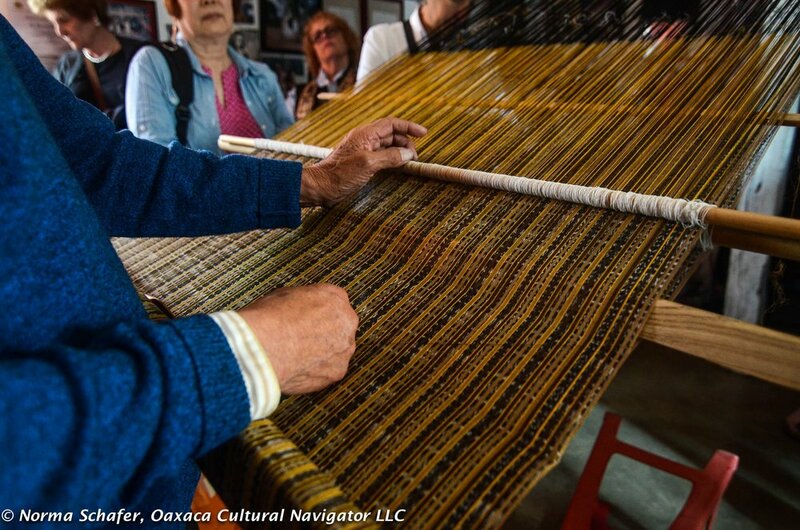 The Li weavers use foot-tensioned backstrap looms, similar to the Katu weavers in Laos. So we know this is also backstrap-woven, and it's made up of several narrow strips, less than 10" wide. The intricacy of the ikat and supplementary warp patterning is mind-boggling. A shot of the whole thing would have erased the detail, since this piece was not well lighted, so I took photos along the more visible edge. The colors are subtle, probably natural dye and probably faded. It's a wonderful work, as are all of the items in this collection. I'm so happy I got to see it, especially with a fellow weaver. Going around with Laverne was fun because neither of us had to explain the basics in order to convey our awe and admiration, as we might have with lay people who don't weave. We could simply say, "Wow, look at that ikat! Look at that twining!" etc. There was plenty to discuss, but we could start at a point of shared knowledge, and we both reveled in the presence of truly great textile work. Dinah Eastop's handwritten chart, categorizing different objects as textiles or not, according to my arrangement. The chart documents a discussion I had with Dinah Eastop, textile conservator and visiting lecturer at UCL in Qatar. It was just the two of us, and she had brought a collection of objects, small enough to fit in her suitcase, demonstrating a wide variety of things that could be considered textiles, or not: a cotton bag, a knitted sock, a rubber glove, a flat loofah with twill tape edging, cotton balls, birch bark, papyrus sheets, decorative beaded medallions, hotel slippers, a plastic scrubbie, etc. My job was to sort them into what I considered textiles and not-textiles. I ended up making a spectrum, with the most obvious textile pieces at one end, progressing through the anomalous and questionable to those that I would not characterize as textiles at all. The exercise was interesting, and the discussion even more so, because it forced me to articulate what my criteria are for designating a thing as "textile." Despite years of studying, making and collecting textiles, I'd never really thought concretely about how to define them or characterize them. I knew there were issues with perception and nomenclature, because when I tell people I work with or study textiles, it's often not readily apparent what I mean. The most striking example of this was when I said I studied (traditional, handmade) textile production - I must have said "traditional" and/or "handmade", but I don't remember - and a woman looked at me and said, "You mean, like child labor?" Um..., no. I realized then that it's the kind of subject that has so many associations that each person will simply attach to whatever is closest to their interests, if they have any associated interest at all. For most people, this means clothing or fashion, in some cases the "textile industry," which encompasses everything from rugs to upholstery to industrial products. There are times when I've felt tired of the word myself, because of its lack of specific, comprehensible meaning. My interest in the subject always has to be explained, defined, and clarified - what kind of textiles am I talking about when I say textiles? In my mind, it's very specific, but the word has such a vast and varied life that it doesn't suffice by itself. These are definitely textiles. Suzani embroidery, left, and Palestinian cross-stitch pillows and bodice pieces, in Amman, Jordan. So although I've grown accustomed to defining the type of textile I'm most interested in, and indeed spent chunks of my master's thesis doing just that, I had never been faced with the practical question of "What is a textile?" Dinah's exercise is brilliant for this, and I enjoyed sorting the objects immensely. Even before I was finished, I found myself raising questions, wanting to discuss particularities - but she wanted me to set them out in my categories, and then we began to discuss. The chart shows how we ended up explaining my characterizations. What emerged was my emphasis on materials and construction. Most obviously, anything with a woven or knitted construction was a textile, and then anything incorporating some element with that construction, such as the loofah with twill tape edging and cloth backing. Then there were questions of flexibility - for example, plant fibers can be made into cloth, but if the plant matter is sufficiently stiff, it moves into basketry, which I distinguish from "textile," although the techniques are still a type of weaving. Simply examining how my own mind responded to each of these considerations, with Dinah mirroring and responding to my comments, led me to understand the complexity of the various factors and the elusiveness of this term in more depth. Exciting stuff, for a textile maker and scholar, let me tell you. We ended up with certain materials that were stumpers, such as leather. Dinah mentioned that when she has done this exercise with other groups, quite often people will put anything that is worn in the textile category, because clothing = textiles in their mind, whether it's a leather sandal or a rubber glove. In this case, the emphasis is on function, rather than material or construction techniques. There are plenty of examples of historical clothing, from ancient Chinese armor to Lizzy Gardiner's American Express card dress which would challenge the question of what makes a textile. And then there's paper, and papyrus, which is similar to barkcloth in terms of production techniques, and modern paper was originally made from cloth waste, after all.... so there is a continuum, and an overlapping of materials and methods that can make something more or less textile-like. I think of clothing made from Tyvek, and how the fabric of this bonded polyethelene product behaves much like cloth. Fijian ceremonial dress made of Masa (barkcloth), UBC Museum of Anthropology. Hawaiian dancers use Pellon® non-woven interfacing to imitate the barkcloth that would have been worn in the past. There was another continuum in my arrangement of the objects, and that was from raw material to manufactured piece. A cotton ball, for instance, is not something I call a textile, although the material can be turned into one. Even spools of thread were not included in my textile category, because by themselves, they are raw materials. This may beg the question of how I would define my own handspun yarn, but I still think I would not call it a textile, even if I consider some skeins as finished objects. One of my favorite "objects" in the textile storage rooms at the UBC Museum of Anthropology. I believe it's from Indonesia, naturally dyed plant fiber. I saw some, at my friend's house, in a bowl of decorative, round objects, and I recognized them immediately as handspun yarns from the souk. Except they weren't. They are Tibetan, she told me, and she bought them in Nepal. I was amazed by the similarity: the general gauge, or thickness of the yarn, the variation, the high twist, indicating that it's meant for rugged materials, were all the same. This set my mind working on the shared culture of nomads, but my thoughts were interrupted when my friend said that well, the yarns in the souk were probably imported or made by Nepalis anyway. Suddenly I found myself vouching for the authenticity of the souk yarns, having seen the spindles and the spinning of wool myself. I was surprisingly invested in convincing her that this was real, handspun yarn and the women I met in the souk are real Bedouins - primarily because it is the truth, and when it comes to textile making I'm always concerned that people know the facts. Handspun yarn, spun and dyed in Doha, hanging to dry at Souq Waqif. The conversation that followed made me wonder about the desire for authenticity in a place or an experience, and the degree to which one's own preconceptions shape what one will accept as authentic. Of course this authenticity discussion is a huge, amorphous topic that has no edges nor hope of resolution. What I wanted to keep thinking about, though, is the role that textile making plays as a marker of authenticity.... When I went looking for Bedouin weavers in Qatar, I was not in search of authenticity - just weaving. People making things. Yes, I hoped to find people that were weaving in a way that was typical in times past, a technique with some historical continuity. Having found that, and the production of yarn that goes with it, I guess my point is that I didn't need to raise the issue or mention the word authenticity. Work was being done with fiber, and I began taking note of how it was done. The work I witnessed correlates with other forms of Bedouin spinning and weaving as documented throughout the Arab world, and so I consider it traditional Bedouin textile production. But the most important point is that people are spinning and weaving. So what is it that is so fundamental in this process, that erases doubt? How does textile making embody cultural preservation? It seems to me that it essentially does, and in different ways depending on the culture under discussion, but this knowledge of how to make is the essence. Especially when it enables people to make clothing and shelter, two of the main requisites and defining aspects of any people. Perhaps it comes down to this: knowing how to provide for a family or community through spinning and weaving is proof of culture bearing. Bedouin weaving WIP: this was my learning piece, so it's not very good. The gazelle horn belongs to my teacher, and her grandmother before her.